Warwick School are through to their third consecutive NatWest Schools Cup Under-15 final after beating Brighton College 33-20 at Allianz Park last Sunday. Warwick almost got off to the perfect start when fly-half Fred Lowe intercepted and the ball was shipped out wide but the final pass drifted forward. When play was pulled back for an earlier infringement, Will Tanner slotted over the penalty for a 3-0 lead. This was shortly followed by another Tanner penalty. The first try of the game saw Brighton centre Alfie Beadle slice though the Warwick defence to score under the posts , with the conversion giving the Sussex side a 7-6 lead. However, a third Tanner penalty edged Warwick ahead once again. When the passes started to stick for Warwick they looked threatening and number eight Oliver Thorneywork supplied their first try with the final play of the half to give them a 14-7 interval lead. The game remained evenly poised but a pivotal moment came early in the second half when Tanner intercepted to score under the posts. This was converted to extend Warwick’s advantage to 14 points. Warwick then scored what looked like the match-winning try when winger Chris David was put away following a brilliant pass from Colia Louis. However, Brighton responded immediately and Beadle picked up his second try following several phases. With the clock ticking down, Warwick looked more comfortable and winger Jacob Weeks produced a searing run around the Brighton defence to score in the corner. 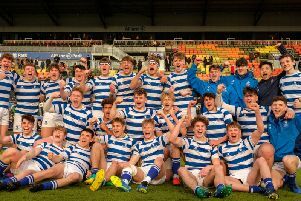 Brighton scored with the final play of the match but it was Warwick’s day and they will now go on to play Queen Elizabeth Grammar School, Wakefield, for a third consecutive time in the final on March 25. Warwick coach Tom Pierce said his side had some big boots to fill but had stepped up to the task amazingly well. “It’s just amazing, the boys fronted up and we are very proud of them,” said Pierce. “It’s hard every year to get all the way through to the final and it is a massive achievement for any group of players and the coaching staff. Warwick School’s under-13 team play in the final of the School Sport Magazine Cup against Trinity School, Croydon, on Wednesday.